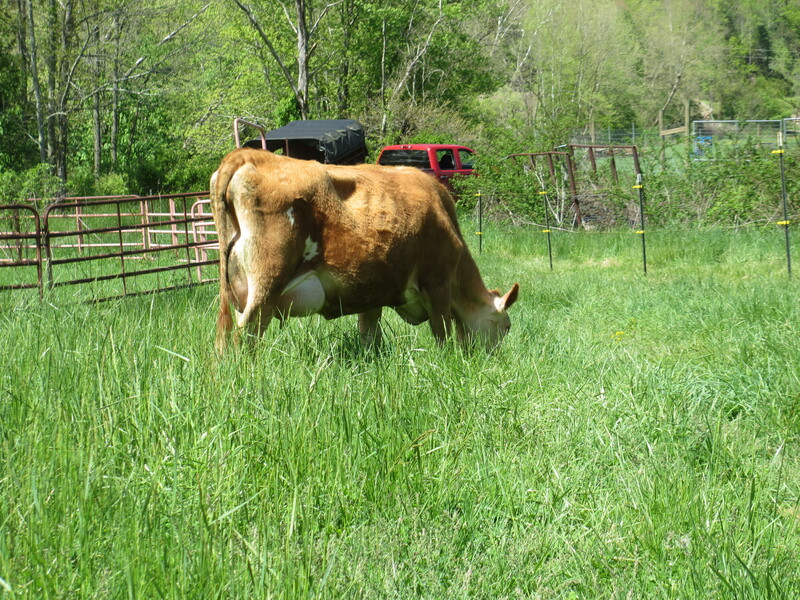 Our animals are raised on pasture and get to spend their life outdoors like animals are meant to be! None of our animals are ever treated with hormones.While once in a blue moon, we may treat a dairy cow with antibiotics, but only if it is necessary for a life threatening situation.We would rather treat our animals then have them die! 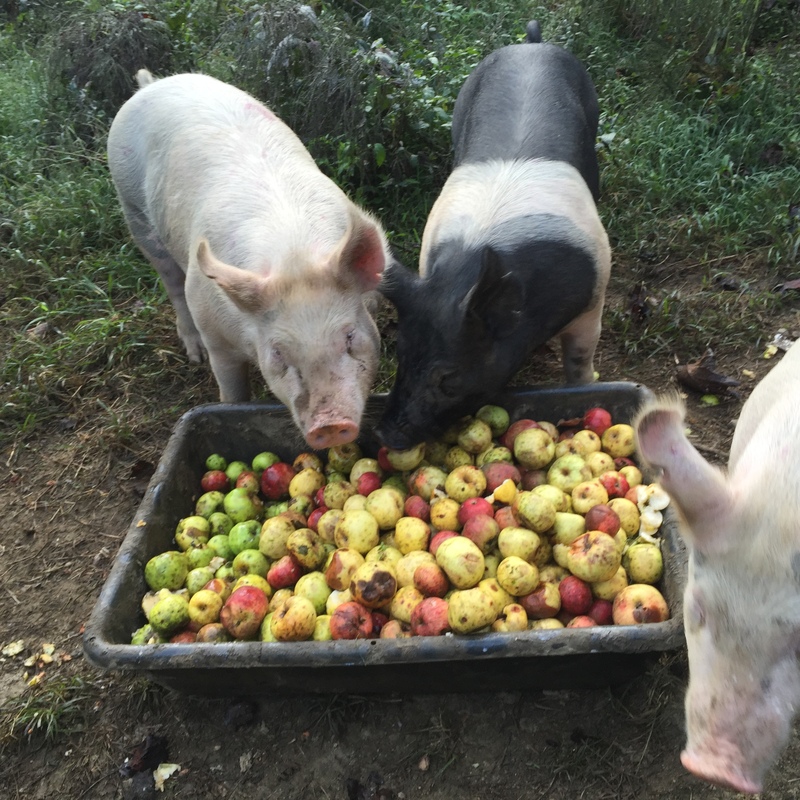 Our chickens and pigs can not live strictly on a grass fed diet, so while they are able to forage, we do give them GMO Free grain.You can read on for how each of our animals are reaised. Our animals are not raised in confinement so spend their life outdoors! 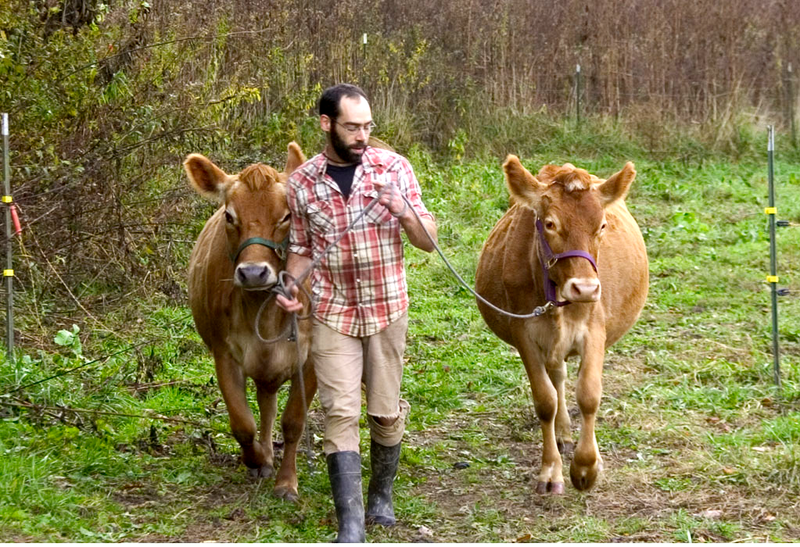 Our dairy cows are raised on a rotational based pasture system, with our farm divided into 5 pastures. Each pasture is seeded with a biculture of orchard grass and clover.Clover being a legume, along with the cows manure, the pasture gets fertilized naturally.Our cows spend a week in each pasture before they are rotated.While milking or before our cows give birth, we supplement their grass diet with a little GMO FREE grain. We operate our farm much like a farm one would see at the turn of the centurey, that has crops integrated with animals. That way we can collect our manure and use that for crop production.We are moving towards a closed loop farming system, where all our fertilizers are produced on the farm, and these animals are key for this process. Our livestock is handled with loving care! The layout of our farm requires us to walk our cows to their pasture daily.During the heat of the summer, our cows graze at night, and stay in the barn during the day. 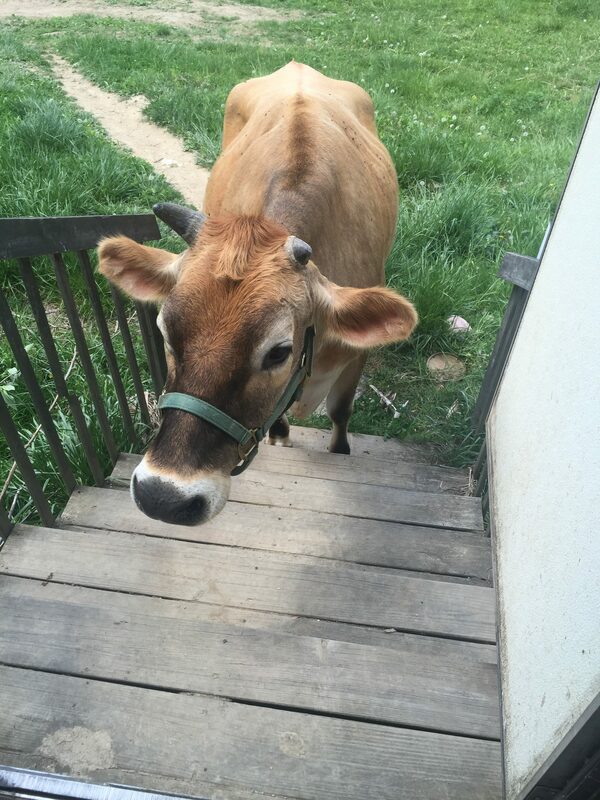 She wants to come inside our trailer. What can I expect the difference between pastured beef and animals raised in confinement? Our grass-fed and pastured animals are roaming around pastures; therefore getting muscular from that form of exercising.Muscle is tougher than unused muscle of animals that are raised on a feed lot and aren’t moving around much.Pastured meat will have a darker color, that isbecause mitochondria, the energy producing organelle in a cell, multiply in harder working muscle. Pastured animals may have more fat and marbling than CAFO animals.All of us animals develop fat in specific order. It’s first develops around the organs. Fat around the organs is a good thing, up to a point of course. It acts as padding and insulation. Next, it develops under the skin and last, in the muscle. That marbling that makes meat tender is from fat in and around the muscle. Since grass-fed and pastured animals aren’t getting the calorie loaded diets with grain and they are exercising,they don’t always have as much marbling.Read on for cooking tips of our pastured meat. 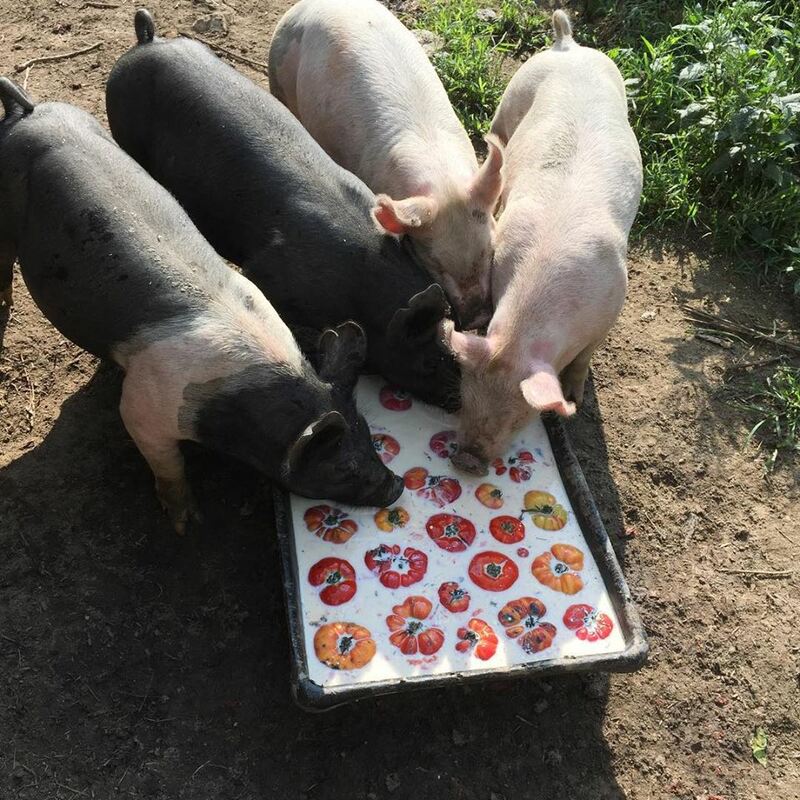 We are a highly diversified farm, our pigs diet not only includes pasture and grain, but a good percentageconsists of milk from our dairy cow, and a wide assortment of produce that we are unable to sell.This is only possible because we raise small batches of pigs on a large pasture. The grain our pigs consumer isGMO free, and never are they given any antibiotics or hormones. 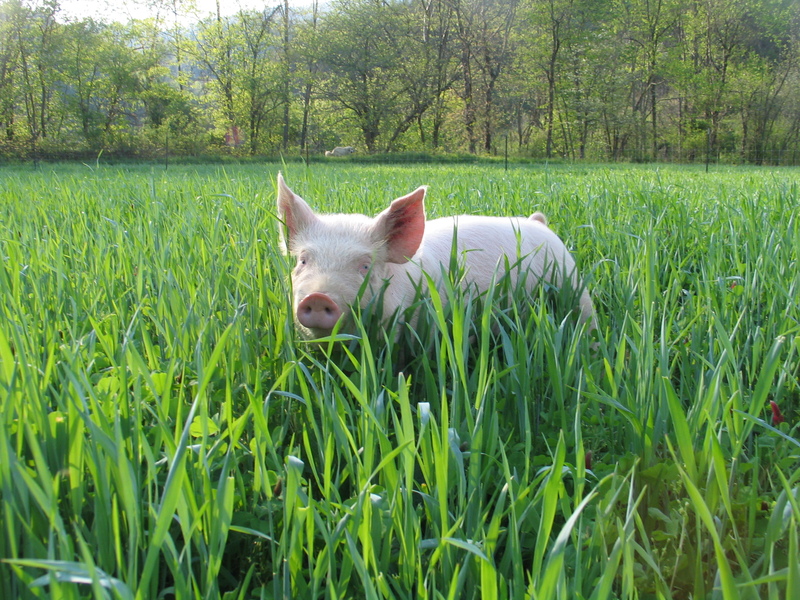 It is our belief that happy pigs, raised on a large pasture, make for healthy and flavorful meat.Keep in mind that we have a limited number of shares available because we raise small batches of pigs. This piggie ate so many tomatoes that he has passed out. 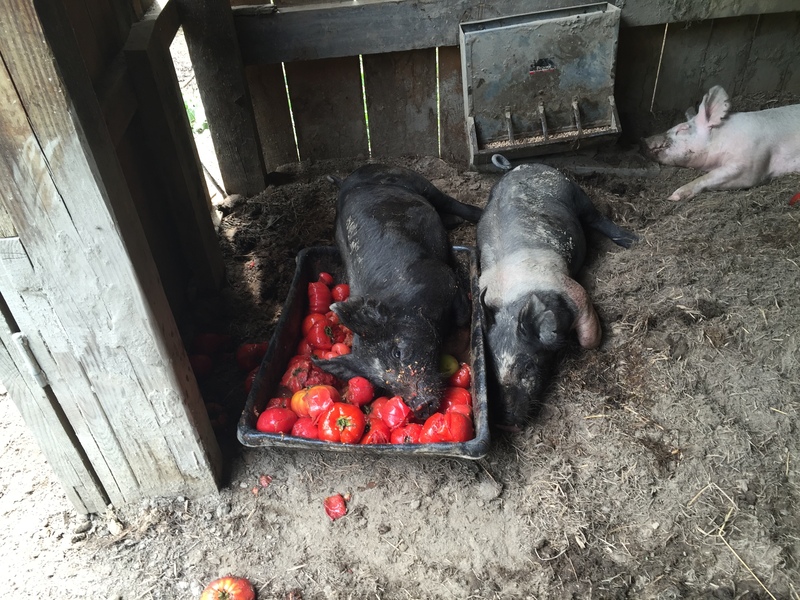 Here our pigs are devouring tomatoes floating in raw pet milk from our grass fed dairy cows. We keep heritage laying hens, and rotate the breeds in our flock.Currently we are keeping Astralorps. We operate our farm much like a farm one would see at the turn of the century, and what is interesting about heritage chickens, is that these birds served a duel purpose for both eggs and meat. Many chickens raised by the large egg factories, have a breed that is only good at laying eggs, but our heritage breeds not only lay eggs, but are great at foraging for bugs and weeds.